Gua Sha is an age old bodywork technique that can be used for pretty much anything from your daily aches and pains or headaches to chronic severe ailments. It is used to intentionally surface petechiae to the skin by using a scraping technique in order to help detoxify the body and relieve pain. 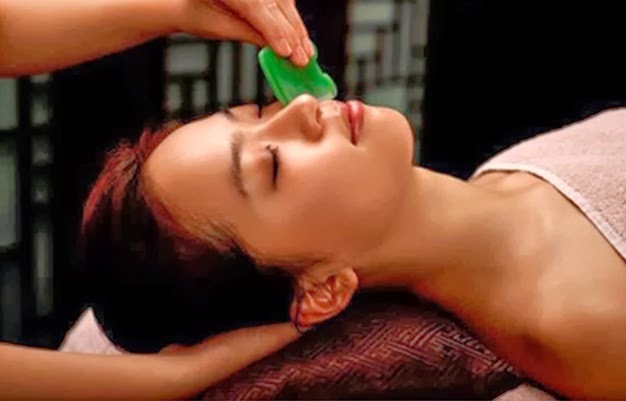 This unique folk healing method is still commonly practiced in China and other parts of Asia and is often performed in TCM clinics, hospitals, spas as well as in many Asian households. Gua Sha is popular in Asia because it is a simple technique that’s easy to use, and the results are often fast and amazing. The word “Gua” means to scrape, and “Sha” has two meanings. ① “Sha” from a TCM point of view, refers to the stagnant blood and qi that is blocking the meridian pathway inhibiting proper flow of energy and blood. From a western medicine point of view, it refers to the fluids that contain metabolic waste that is congested in the tissues and muscles. ② “Sha” also refers to a series of reddish, minute hemorrhages that look like a red colored speckled rash called petechia that can surface to the skin after the Gua Sha treatment. In this bodywork technique, a round edged tool such as a spoon is used to scrape the skin to release the stagnant blood and qi or “sha” to the surface of the skin and appears as a group of petechia. This may sound and even look bad, but it’s very detoxifying and cleansing for the body. By letting your body get rid of this old stagnant blood, new and better performing blood cells can be created. Remember, there’s only so much room in your body so sometimes you have to be willing to let go of the old in order to bring in the new. Gua sha is a great method to help your body release excess wastes and help bring in refreshing nutrients to your cells. considered to be the cause of many diseases in TCM. To visualize this, you may want to compare the water from a running stream versus the water in a still stagnant pond. The stagnant pond will be full of gunk, green moss and other growths while the running stream will have clear water. Our entire blood circulation is very similar to this. When the blood is not flowing properly, it starts to become stagnant and creates an environment more suitable for disease. This is why Gua Sha is such a useful technique. It can quickly release blockages in your body caused by stagnant blood. This is because it mimics sweating and promotes body fluid circulation which helps to normalize cellular metabolic processes and release toxic waste from your deep cellular tissues. It also increases blood and qi circulation to help oxidize your cells as well as nourish them. In other words, gua sha has two main functions where it both nourishes and detoxifies. One, the stroke action used to release petechiae to the surface of the skin, forces more blood and oxygen to the area treated which helps to nourish those cells. The area that will be treated will first be lubricated with Homo Cream. (It is also beneficial to first treat the body with either a hot bath or an infrared sauna before the treatment in order to warm up the muscles and increase blood circulation.) A chosen area of the skin is then stroked in a downward motion using a smooth edged device that can be made out of rock, jade, buffalo horn, or plastic etc. If these are unavailable, use Magnetic Clay. The skin only becomes red, and no petechiae surface then that means there is no “sha” in the area and you can start scraping another part of the skin. How long does it take the petechiae to fade? The sha usually fades within 2 to 4 days. What can Gua Sha be used for? Everyone said my legs were slimmer and my stomach was smaller. Even now, when I can tell that my body is out of shape or I start to have some chest problems, I’ll start using the scraping technique. I start seeing results immediately; it never ceases to amaze me. I really encourage people to just go out there and give this technique a try.